Many former NHL-Players, such as Janne Laukkanen or Toni Lydman, have started their career in the region of Lahti. Some of the football matches for the 1952 Summer Olympics were played in Lahti. In Lahti (and also Finland in general), you can find more saunas than people. Lahti has over 10 twin cities, including Garmisch-Partenkirchen (Germany). With its many lakes, Lahti is one of the most popular summer house locations in Finland. Lahti is a city of sports, sporty outfits are almost always accepted as a dress code. So there we go, I will now tell you some of the most fun things to do in Lahti, and giving you more reasons to choose Lahti as your day trip from Helsinki. As I already said, Lahti is the perfect city for you if you love to be in nature, especially when combining it with sports activities. There is so much to do! Kiikunläh… what the hell? This is what I thought when I saw this name on our Lahti Itinerary. What I can tell you already is, that it was the most beautiful place I saw during my short time in Finland! As I grew up in Switzerland I’m used to crystal clear lakes, but this lakes color was seriously on another level of beauty. No surprise did Kiikunlähde get involved into the most Instagrammable places in Finland by the Finland tourism board. But how comes the water is so beautiful? 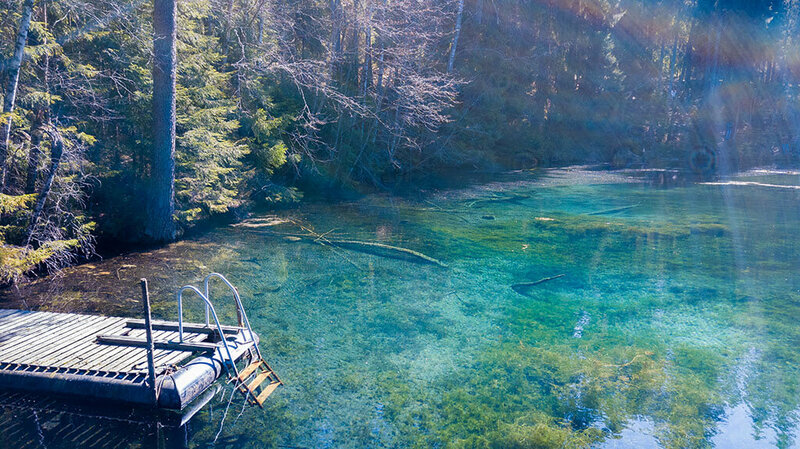 Kiikunlähde is a turquoise pond, with water that never freezes. It’s 400meters long and the widest point is 400meters. Due to its steady water flow, it’s extremely clear. The lake is part of a private property, so if you decide to visit respect that – it is also not allowed to swim in there. To take amazing images I recommend bringing a drone. For me, Kiikunlähde is for sure one of the most interesting and beautiful places in the Lahti region. Another great thing to do in Lahti is to attend a workshop in a printmaking Studio called Painovoima. Hosted by a professional printmaker (cheers to Pekka!) 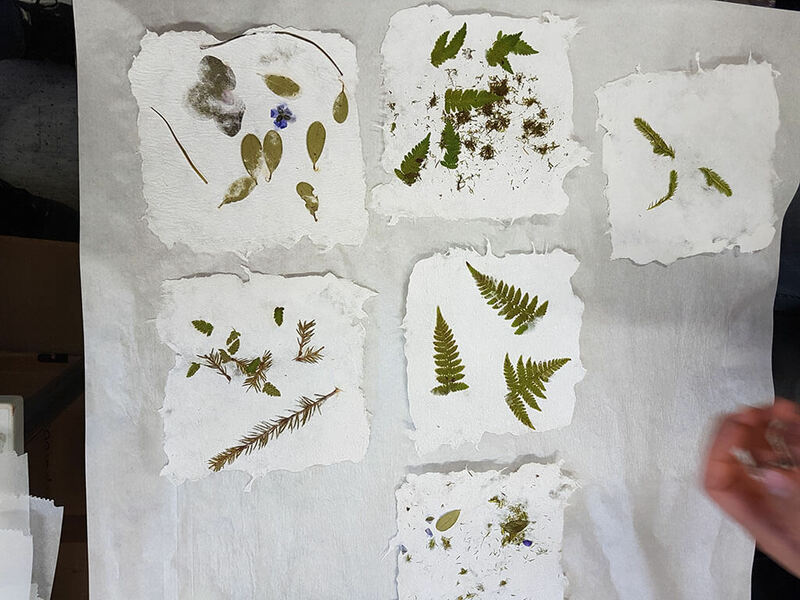 we produced our own little souvenir, consisting of paper and greens we found beforehand in a forest. The place where the workshops take place is also home to other freelance workers, mostly artists. There is a great atmosphere and we really enjoyed listening to the interesting stories of Pekka while creating our own “piece of art”. Something I also really enjoyed to do in Lahti was a fat-bike tour around the beautiful lake district of Lahti. While the region is famous for traditional cycling, running and even open water swimming there are also some fancy sports upcoming in the region – such as Stand-Up Paddling or Fat-Biking. 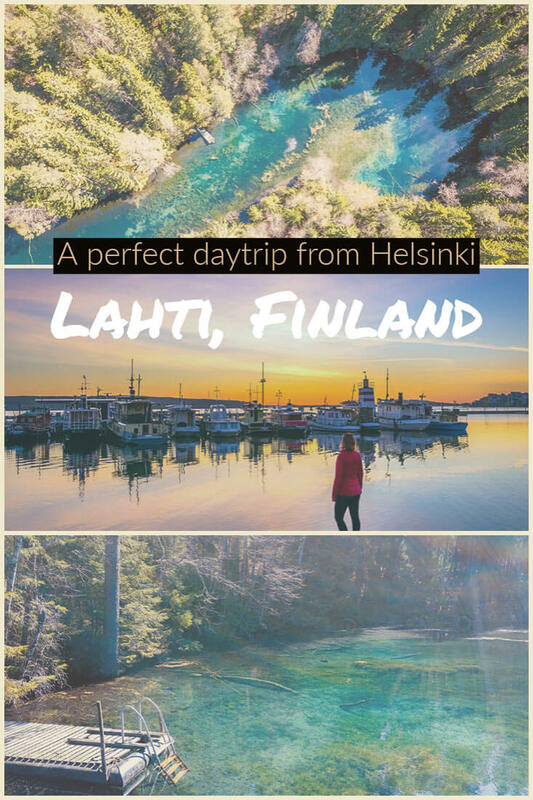 These activities are also a great idea when you just do a day trip from Helsinki to Lahti, as they just take a few hours, depending on your route. Together with our guide Pekka (again, yes! :D) from a company called Kitetirri we cycled around the beautiful lakes, over hills and just had a great mix of sports and relaxing in nature. There are also electronic fat-bikes available, so this is an activity in Lahti that everybody can attend! 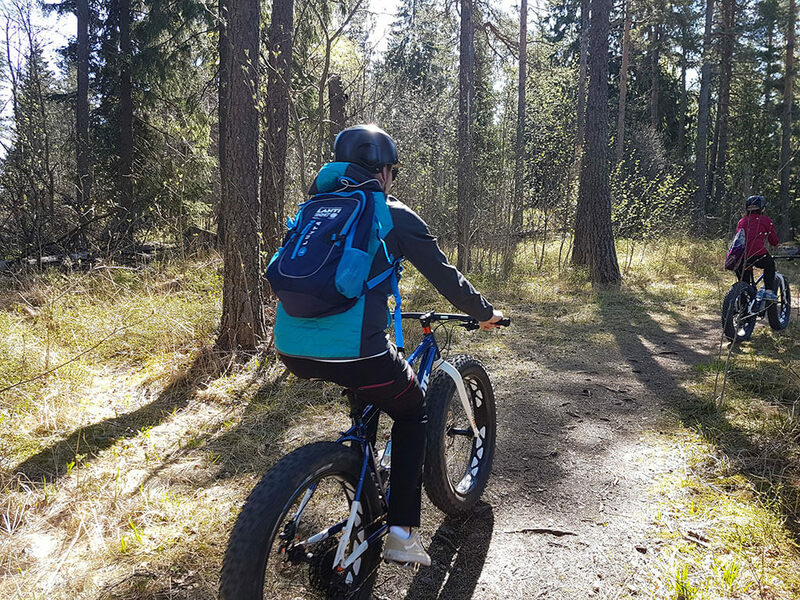 Fat-Biking in Lahti was so much fun! You guys know how much I love good food – and Finland offered me a lot of it! I was actually surprised that they mainly used products which are available in their own region – sustainability is something important for Finns. 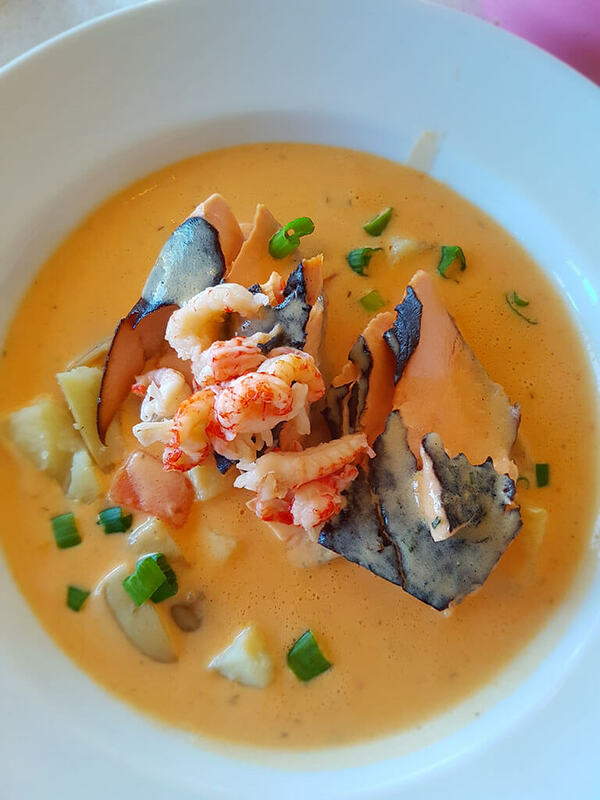 During my stay in Finland I tried several dishes with Salmon, and while they were all amazing, this particular salmon soup stood out for me. We had it at “Myllysaaren Kommodori Beach”, which is an island on the lake, and only accessible by bike or walking. But believe me, it’s worth getting there! You might wonder if Finland is the perfect place for climbing, as the country is mainly flat and full of lakes. I did the same. However, we found a pretty high rock to do rock climbing in Finland! While I was absolutely not talented (and I am Swiss haha!) 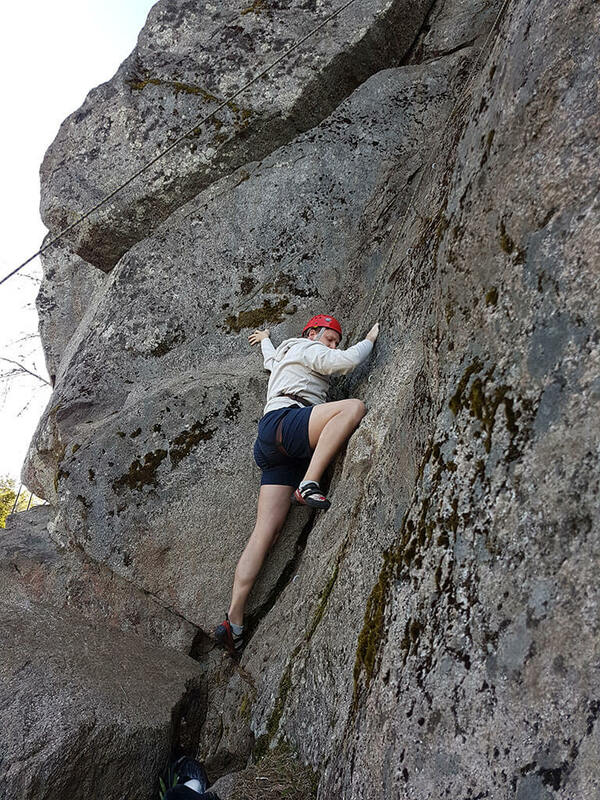 it was still fun to try out – and we tried out several climbing routes. Rock climbing might not be a traditional activity in Finland, yet, it was still a great thing to do in Lahti to mix up our itinerary a bit. Our guide was from the company Dynact, which offers climbing lessons. Me trying (!) to climb a rock. While going into a sauna is definitely a must-do in Finland in general, we tried out a special smoke sauna in Lahti – more precisely in the Farm Restaurant Hollolan Hirvi. The traditional Finnish farm has origins from 1900 and is home to a high-standard smoke sauna, a restaurant, and even a beer brewery. With its remote location inside the Finnish nature, it’s a perfect getaway to relax and have a great time. I personally enjoyed a 45 minutes sauna yoga session and afterward, we could enter the already prepared hot-tub while drinking a herb smoothie. The atmosphere is very familiar and the owner told us stories about the farm while drinking the farm-brewed (& tasty!) beer before heading to dinner. For me, this was certainly one of the best things to do in Lahti! 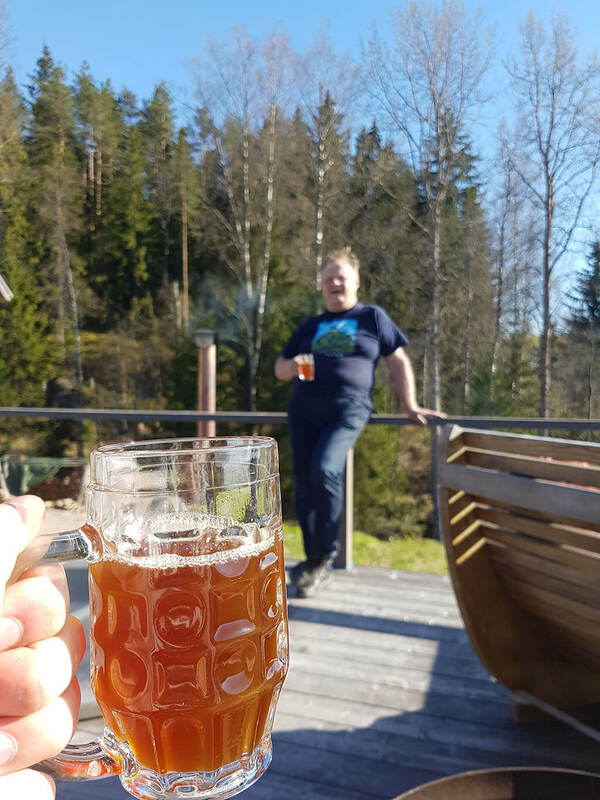 Enjoying a tasty beer after a yoga sauna session. I have to admit: This sounds absolutely insane. I also have to admit: It actually is! 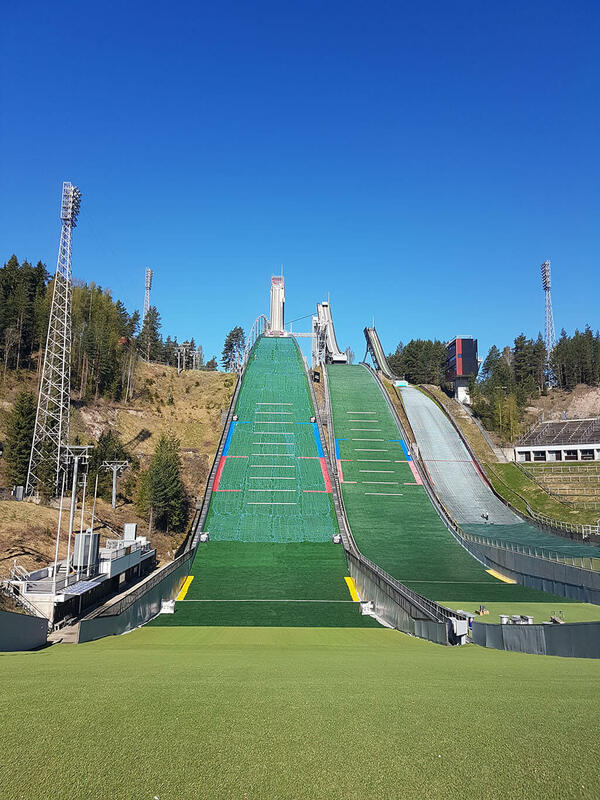 Lahti is home to events of the Red Bull 400 series, which basically means that a bunch of crazy people is trying to run up a Ski Jump Mountain in the fastest time possible. Something absolutely exhausting and crazy. So as I said – this is something crazy, but sometimes it’s good to be crazy and why not doing a day trip from Helsinki to attend this event? My time was 8 minutes, challenge accepted? Running up this hill, crazy but fun. This seems like an obvious choice – just because sunsets are usually beautiful and worth watching. However, the sunsets in Finland were special and even more intense than in other places. The colors were really strong and intense, which created incredible sceneries, especially in combination with the many lakes around. 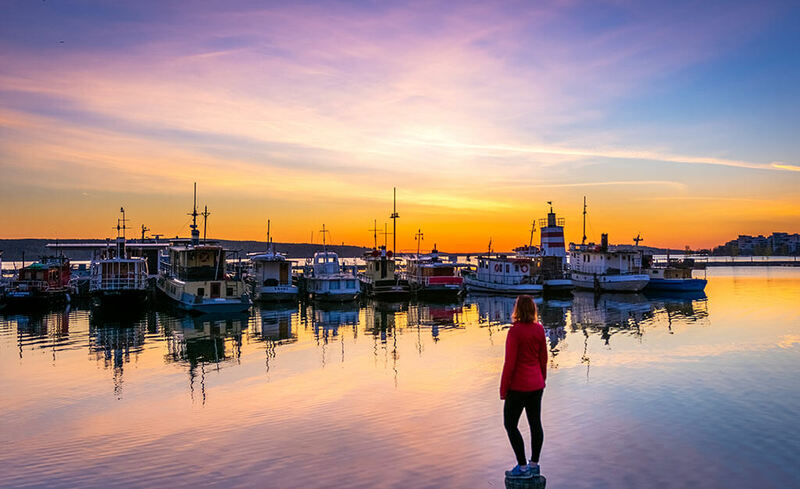 So if you decide to visit Lahti you should definitely take some time for watching the beautiful sunsets, which are one of the reasons why a day trip from Helsinki is so much worth it. Of course, I also had to stay somewhere in Lahti – here are the hotels in Lahti I stayed in plus a budget version I added for you. The first two where excellent hotels, but yet so different. While the Solo Sokos Hotel was more like a traditional hotel that we are used to (with amazing rooms and breakfast) the Töyrylä Manor is a fancy and private owned place with so much love for details. The whole building is full of artifacts – and every piece has a story behind it. So I’m sure you’re covered by a good selection of hotels in Lahti and I hope you can find the perfect place for your stay in Lahti. Solo Sokos Hotel Lahden Seurahuone: A hotel full of history located in the heart of the city. Hotel Töyrylä Manor: Fancy manor outside of Lahti with a passionate and very friendly owner, perfect for couples. Hostel Matkakoti PatriaHostel Matkakoti Patria: Great location (nearby the city and train station) for a fair price. How to get to Lahti? That is actually really, really easy! Lahti is located just an hour drive (by car) from the Helsinki airport and harbors, making it the perfect option for a day trip from Helsinki. Of course, you can also reach it by public transport, as there are several connections from Helsinki. If you are looking for inspiration you can just scroll up and will find some things to do in Lahti!